Rick Roufus was born on June 3, 1966. 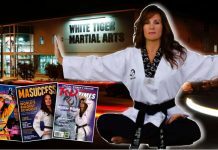 He is an American Professional kickboxer, fighting out of Roufus Kickboxing Centre in Tempe, Arizona. 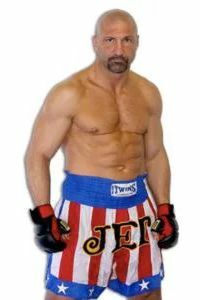 Roufus earned the nickname, The Jet and he has been a six time full contact kickboxing world champion, winning two different weightclass titles under the IKF. In the early 1990s, Roufus choose to train and fight in conventional boxing. He enjoyed some success as a boxer, winning the WBC’s Continental Americas Cruiserweight title, but unable to fight for a world championship as a conventional boxer, he returned to kickboxing in the late 1990s. Roufus lost his ISKA. 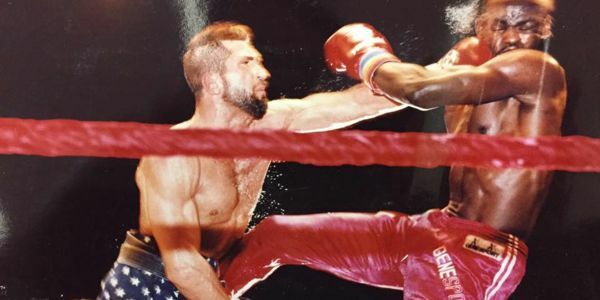 Full Contact World Light Heavyweight title by 11th round KO in the rematch to Ernesto Hoost in 1994, but he was able to add the K-1’s U.S. championship to his six world titles in 1998. Roufus holds a record of 63 wins and 9 losses, with 43 wins by knockout. In 2006 he defeated Mehrdad Khan Moayedi by TKO in the 3rd round. Rick Roufus was born in Milwaukee, Wisconsin on June 3, 1966. He started learning taekwondo from his father. 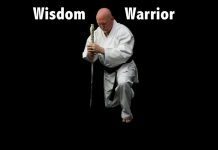 He won national karate titles as an amateur under full contact rules where leg kicks, elbow strikes, and knee attacks were not allowed before he debuted as a professional kickboxer under full contact kickboxing rules. In January 1986, Roufus fought against Sylvester Cash for the American national middleweight PKC title. He won this fight, and his first title. In April 1987, he fought against John Moncayo for the KICK world title (Karate International Council of Kickboxing) at super middleweight. Roufus knocked out Moncayo at 7R, and won his first world title. In November 1988, he fought against Changpuek Kiatsongrit from Thailand. This was the first fight Roufus fought under kickboxing rules which allowed leg kicks. In the first round Roufus knocked Changpuek down twice with punches, but Changpuek’s Thai kicks to Roufus’ legs took their toll and Roufus moved away from Changpuek to avoid the painful kicks. In round 4, Roufus couldn’t continue and the referee stopped the bout when Roufus fell to the canvas. It was soon discovered that both his legs were broken. After the fight, the Roufus brothers sought out Thai experts to learn the art of delivering and checking leg kicks one of whom was Saekson Janjira. In August 1989, he fought against Marek Piotrowski from Poland to defend his national title, but he lost by unanimous decision at the end of round 10, losing his title. In April 1990, he had his first professional boxing match and fought against Ricardo Dabney, but lost by decision at the end of round 4. 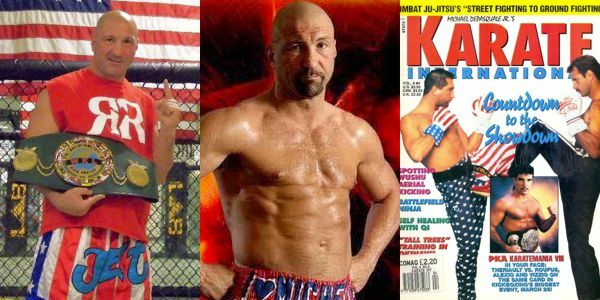 In January 1994, Roufus fought against Michael McDonald from Canada for the vacant title of IKF Professional Full contact light heavyweight. He knocked out McDonald in 43 seconds into round 1, and became the first IKF full contact light heavyweight world champion. Roufus shifted his focus to professional boxing again in 1995. After five consecutive wins, he drew with journeyman Louis Monaco in January 1996. In August, he challenged the vacant title of WBC Continental Americas at cruiserweight. He knocked out Sean McClain in the 4 round, and won his first and only title in boxing. In February 1997, he fought against Arthur Williams who became IBF world cruiserweight champion later for the vacant title of USBA at cruiserweight, but he was knocked out in the 4 round and failed to win another title in boxing. 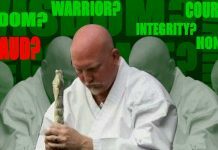 In 1998, Roufus was sanctioned as the first world champion of IKF Professional International rule at heavyweight as he requested to shift his title and he met IKF’s conditions. In addition, Roufus got his first daughter in this year. In May 1999, Roufus fought against Stan Longinidis from Australia to defend his IKF title. At the end of the 9 round, Longinidis suffered a broken bone in his foot and the bout went to the judges’ decision. Roufus was ahead on all 3 judges cards, 89-81, 86-83 and 88-81, and he retained his title. In November 2001, Roufus had a boxing match and fought against Dale Brown who was the North American and Canadian national champion, but he was knocked out in round 9, and with this match he choose to quite boxing. On May 3, 2002, in his rematch with Michael McDonald, he tore his ACL (Knee). However, Roufus came back to fight, and defeat Maurice Smith, a year later. On September 29, 2003 Roufus Officially announced his retirement to IKF and returned IKF his title, but he continued to fight in K-1 and MMA. Roufus, was scheduled to make his MMA debut at the San Diego Sports Arena against former UFC heavyweight champion Mark Kerr at a WCO event held on January 12, 2008, but his application was denied by the California State Athletic Commission. In his MMA debut at Strikeforce: At The Dome in Tacoma, Washington on February 23, 2008, Roufus lost to former UFC heavyweight champion Maurice Smith in round 1 via kimura. On March 29, 2008, Roufus had his second MMA bout, in Newkirk, Oklahoma fighting for Caged Combat Championship Fights'(CCCF) “Battle on the Border” event. Roufus defeated Mike Buell via unanimous decision. Since then he has won two more fights against BJ Lacy and Roberto Martinez bringing his mixed martial arts record to 3 wins with 1 loss. Rick Roufus will fight former professional boxer Jeremy Williams.